Please be aware that information on this page is correct at the time of writing. However, regulations do change and it is important to consult your local embassy for updated information about travel and visa requirements for Botswana. 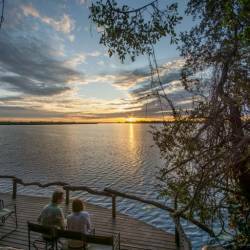 Botswana is a popular destination and to avoid disappointment, accommodation bookings should be made well in advance. The busiest times are during the South African, Botswana and European school holidays. Every visitor to Botswana must be in possession of a passport that is valid until six months after the initial date of arrival and have sufficient pages for entry and exit stamps. No visas are required by citizens of EU countries, most Commonwealth countries, the USA, South Africa, Switzerland, Israel and Norway. It is vital for visitors to carry a valid passport and sufficient funds to facilitate their stay. Citizens of most European and Common-wealth countries do not require a visa for entry into Botswana. Upon arrival you will receive a 30-day entrance stamp and, for those who plan on travelling onwards to Botswana's neighbouring countries, visas for Namibia, South Africa, Zambia and Zimbabwe can be obtained in Gaborone. Drivers Licence (Valid International Driver's Licences' are accepted). If not written in English, a certified written translation is required. If the vehicle is not registered in your name, rented or still being financed, you will require a letter of authority from the financial institution or owner of the vehicle, giving you permission to take the vehicle across a Botswana border. The letter to state dates of travel and to be attached together with the vehicle licence papers. Both the letter and the registration documents need to be signed by a Commissioner of Oaths. You will require a temporary import permit (TIP) to bring a vehicle into Botswana. You can purchase this at the Botswana border post. You will also require a country of origin sticker for your vehicle, indicating the country it's registered in. You may purchase these decals from AA agencies. Remember, no pork whatsoever is allowed across Botswana's border. The regulations on importing meat and meat products change frequently because they are based on disease outbreaks in different countries. Ask your nearest customs office before importing meat and meat products. These are goods that can only be imported with a license or permit. • Firearms, ammunition and explosives. • Indecent and obscene material such as pornographic books, magazines, films, videos, DVDs and software. If you are travelling to Botswana from areas infected with Yellow Fever, you must have a valid Yellow Fever vaccination certificate. Otherwise, no other immunisations are required. However, it would be wise to have an updated TPD (tetanus, polio, diphtheria) vaccine, and a Hepatitis A vaccine. Visitors are advised to wear long sleeves, socks, closed shoes, and generally keep the body covered, to sleep with a mosquito net and to use mosquito coils and mosquito repellent. Pregnant or very young children are not advised to travel to malarial areas. Symptoms include fever, shaking, backache, headaches, diahorrea, vomiting and drowsiness. Always take preventive measures that include wearing a wide-brimmed sunhat and sunglasses, liberally applying sunscreen every three or four hours, regularly taking rehydration mixes, drinking plenty of water and fruit juices (at least three litres of liquid daily) and avoiding prolonged exposure to the sun. The Botswana currency is the Pula (meaning 'rain' in Setswana). It is divided into 100 thebe (meaning 'shield' in Setswana). Travellers' cheques and foreign currency may be changed at banks, bureaux de change, and authorised hotels. The South African Rand, US dollar, Euros and the British Pound are the most easily convertible currencies. Automatic teller machines accept foreign visa cards and are mostly found in larger towns and cities. Cultural sites and community art and craft outlets usually only accept cash. Major credit cards, such as MasterCard and Visa, are accepted throughout the country, in most hotels, restaurants, retail outlets and safari companies. However, shops in remote areas and service stations may only accept cash and some establishments do not accept payment by Diners or American Express. Seven main commercial banks, as well as a number of foreign exchange bureaux, operate in Botswana. In city restaurants and bars, a 10% tip is the norm when the service charge is not included. Provided the service is good, it is customary to tip lodge staff and guides. Botswana's climate is semi-arid. Though it is hot and dry for much of the year, there is a rainy season, which runs through the summer months. Rainfall tends to be erratic, unpredictable and regional. During the summer months, shorts and T-Shirt are recommended with a long sleeve cotton shirty for protections against the sun if you have a fair complexion. Choose cotton clothing in neutral, cool colours that blend with the bush for daytime and wear lightweight long-sleeved clothing at night to protect against mosquitoes. Comfortable walking shoes or hiking boots are a must. Include Binoculars, torch, insect repellent, lip salve, sunscreen, sunglasses and hat/caps when packing. Botswana Standard Time is 2 hours ahead of Greenwich Mean Time (GMT+2). Botswana is accessible by tarred road from South Africa, Zimbabwe, Zambia and Namibia. Most major roads in Botswana are tarred and driving conditions are generally good. Four-wheel drive is required when travelling in the national parks and reserves, as well as in remote areas. Vehicle rental services are widely available in major tourist centres, airports and hotels. Drivers are required to carry their licenses at all times. Licenses from neighbouring countries are accepted in Botswana. If not written in English, a certified written translation is required. Valid International drivers' licenses are accepted in Botswana. Carry all your vehicle documents in a safe place in the vehicle. Seat belts when driving a car in Botswana are mandatory. Always carry at least 1 spare tyre. Watch out for wildlife and domestic animals on the roads. In the National parks always stay on the established tracks. Stay below the 40km/h speed limit for the safety of wildlife and yourselves. In the Okavango, don't swim in lagoons or streams; there is the danger of crocodiles and/or hippos. Children must be constantly supervised in wildlife areas. Cigarette butts should be well extinguished and placed in a rubbish bag, not thrown on the ground. Leaded and unleaded petrol and diesel are readily available at petrol stations in Botswana. Petrol stations in Botswana open from 8am to 8pm. In the more remote areas it is common for petrol stations to run out of gas. When leaving any main town do ensure you have a full tank of fuel. Maun: Regular flights from Johannesburg and Windhoek mean easy access to the Okavango Delta's gateway airport. You'll transfer to light charter aircraft for your flight into the Delta. Kasane: Fly to Chobe's gateway from Johannesburg, Gaborone or Maun. The international access code in Botswana is 00. When calling international to Botswana, dial + 267. Most major towns in Botswana have coverage as well as portions of the national highway. In more remote areas there may be no coverage. Visitors are advised to purchase a sim card starter pack on arrival in Botswana – this will allow you to make calls at the local rate. Starter packs are available at most petrol stations and supermarkets. Tap water throughout the country is safe to drink. Bottled mineral water is readily available in most shops and supermarkets, and at camps and lodges. Tourists travelling by road are advised to carry sufficient water at all times. Water in urban areas is chlorinated, and is drunk from the tap by the local population. Visitors with sensitive stomachs and advised to drink bottled water. Don't bathe or drink from still pools of water; there is the danger of bilharzia. Botswana is one of the safer countries in Africa and the people are very friendly. Nevertheless, visitors are advised to always be aware of their surroundings.